Make sure all gas appliances are turned off. Don’t smoke or use naked flame. Don’t use anything electrical; don’t switch anything on or off. If the smell persists turn off the gas at the meter, or at the regulator on the cylinder of gas. Go outside of the house, or into a neighbour to call The Bord Gais 24 hour Emergency Line 1850 20 50 50. If you can’t get through, dial 999. Gas Applicances, Cookers, Fires, Boilers etc. All gas appliances, whether for Natural Gas or LPG have to be fitted by a Registered Gas Installer. Make sure your gas appliances are serviced regularly by a Registered Gas Installer. Make sure when purchasing your gas appliance that you ask for the correct gas type, a Natural Gas appliance or an LPG appliance. Use appliances ONLY for the PURPOSE for which they were designed, e.g. do not use a cooker to heat a room. If you suspect an appliance may be faulty or leaking gas, stop using it immediately and arrange for a safety inspection by a Registered Gas Installer. Maintain gas meters or gas regulators in a safe condition and free from damage. Always light your match or press ignition button before turning on your gas burner. Your gas burner should produce a blue flame. Call a Registered Gas Installer if the flame is yellow or red. Keep anything that may be flammable away from your gas appliances. Make sure your rooms are correctly ventilated. Do not block vents. Double check that all your gas appliances are turned off before you go to sleep or leave the house. BBQ and Patio heaters are not to be used indoors, they are designed for outdoor use only. Carbon Monoxide, Know the Danger Signs. Staining, sooting or discolouration around the appliance. A yellow or orange flame where normally blue. Condensation or dampness on walls and windows in the room once the appliance is lit. A strange smell when the appliance is on. Rusting or water streaking on appliance cabinet/vent/chimney. Loose or disconnected vent/chimney connections or guards. IF YOU DETECT ANY OF THESE CONDITIONS, HAVE A PROFESSIONAL SERVICE TECHNICIAN EXAMINE THE UNIT FOR SAFETY. Indoor use of a barbecue grill or outdoor heater. Poor installation of heating appliances. Improper operation of heating appliances. Property alterations or home improvements, which reduce ventilation. Running engines such as vehicles or lawnmowers in garages. Using cooking appliances for heating purposes. If anyone in your house has any of the symptoms outlined above get fresh air immediately, then go to your doctor or accident and emergency department and ask to be checked for Carbon Monoxide poisoning. Stop using the appliance immediately and do not use it again until it has been checked by a registered installer or a qualified service agent. If you find a person ill or unconscious and suspect Carbon Monoxide poisoning, ventilate the area immediately by opening windows and doors. Call 999. Carbon Monoxide (also known as CO) is a colourless, odourless, tasteless poisonous gas and is a common yet preventable cause of death from poisoning worldwide. Approximately half of the deaths from unintentional CO poisoning result from the inhalation of smoke from fires. Other significant causes are vehicle exhausts and deaths in industrial/commercial settings. On average between 1 and 2 people die each year in Ireland from unintentional CO poisoning in the home in incidents related to domestic heating or other fossil fuel installations in the home (i.e. excluding the inhalation of smoke from fires).The incomplete combustion of organic fossil fuels such as oil, gas or coal is a common environmental source of CO and is responsible for many cases of non-fatal unintentional CO poisoning. In normal conditions the combustion process (the addition of oxygen) will result in carbon in the fossil fuel, combining with oxygen in the air, to produce Carbon Dioxide (CO2), the same substance we exhale when we breathe. However, if there is a lack of air for the combustion process or the heating appliance is faulty, Carbon Monoxide can be produced. When CO is inhaled into the body it combines with the blood, preventing it from absorbing oxygen. If a person is exposed to CO over a period, it can cause illness and even death. Carbon Monoxide has no smell, taste or colour. This is why it is sometimes called the "Silent Killer". Carbon Monoxide alarms can be used as a backup to provide a warning to householders in the event of a dangerous build-up of CO. Check that the Carbon Monoxide alarm complies with the EN 50291 standard. CARBON MONOXIDE ALARMS ARE NOT A SUBSTITUTE FOR REGULAR INSPECTION AND MAINTENANCE OF APPLIANCES, VENTS, FLUES AND CHIMNEYS. Do have a fully insured and qualified registered gas installer commission your gas installation. Do keep your gas cylinders in an upright position at all times. Do cover your gas installation; it will protect your hoses and regulator from the weather, such as rain, frost and direct sunlight. Do replace any cracked or damaged hoses. Do securely store your cylinders. The cylinders should be chained to wall or secured in a way that they cannot fall over (or be used as a climbing frame for children). Do store your gas cylinders in the shade and out of direct sunlight. Do be careful with your cylinders; treat them with respect to make sure the valve does not get damaged. Don’t store or use cylinders in basements, below ground level or near a drain or shore. Don’t try to adapt or alter a cylinder in anyway. Don’t store cylinders where they could obstruct access areas, passageways, stairwells or emergency exits. Don’t attempt to disconnect a regulator from a cylinder if the flame doesn’t extinguish when the regulator or cylinder valve is turned off. Don’t use propane cylinders indoors residentially. Butane can be used indoors in cabinet heaters and when installed by a qualified gas installer. Don’t use cylinders in high rise flats. All gas appliances, be they for Natural Gas or LPG, by law, must be installed by a registered gas installer. From 26 June 2009 it became a legal requirement to be registered with the Registered Gas Installers of Ireland (RGII) to install, repair or service a Natural Gas appliance. 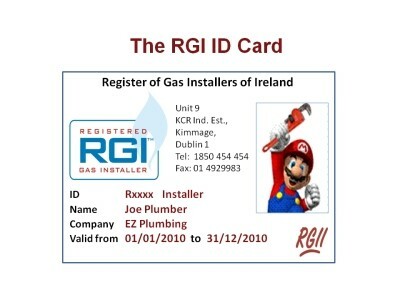 From 27 June 2011 it became a legal requirement to be registered with the Registered Gas Installers of Ireland (RGII) to install, repair or service an LPG gas appliance. A Registered Gas Installer will give you an RGII certificate of conformance for every job carried out. If your installer is not RGII registered and does not present a certificate of conformance, then, in the event of a gas incident, your home insurance will not cover the cost of damages. A non-registered gas installer may also face a fine of up to €15,000 and/or 6 months imprisonment. What is a Registered Gas Installer (RGI)? An RGI is an installer who has at least a GID (Gas Installer Domestic) qualification or equivalent in gas safety which makes him/her competent to carry out gas works. He/She will also have a valid insurance and will have paid the annual subscription fee which entitles him/her to be on the register of RGIs and carry an ID Card with a valid date. By using an RGI you have the peace of mind that you are dealing with a trained installer who has the required expertise in gas safety to ensure your gas installation is safe. Each RGI carries an ID Card which is renewed annually. The ID on the card is a number from R0001 to R3000 and the photo is one of the installer. Ensure the card is in date. If you have a query or need information about our products & services, please do not hesitate to contact us. Do you have natural gas or bottled/bulk gas?